As we see the United States Army has started the process of issuing a new service pistol, I have decided to take a look through history and measure various opinions to determine what would be the top 10 Army pistols of all time. I am leaving the new pistol out of this top 10 list, but let me tell you what soldiers will now be carrying as sidearms. In January of 2017, the United States Army had determined the new sidearm will be the SIG Sauer P320. It will chambered with the 9 x 19 Parabellum which is NATO consistent. What many love about the new M17 is its great setup for either right or left-handed shooters. It is a modular design and can be fit to the user’s taste. We will watch and see how soldiers like this new sidearm. Now, let’s take a look at the top 10 Army pistols in history. I will start with #10 and work down to the #1 sidearm. Scroll down and see if you agree. First made in 1848, Samuel Colt designed this .44 caliber sidearm that was primarily used by the U.S. Army Dragoon regiments. Produced up until 1860, these revolvers had an effective range of up to 80 yards. These guns were heavy at just over 4 pounds but packed a mean punch. This was a flintlock that was a .54 caliber and manufactured at the Harper’s Ferry Armory in West Virginia. They were made up until 1808 and since they were a single shot, soldiers were issued 2. These great pistols are recognizable on the insignia of the U.S. Military Police Corps. This is the gun that is called The Peacemaker and The Gun That Won The West. It was originally manufactured as a service revolver in 1872 but became so popular that all “gun slingers” were known to have a Peacemaker. The Colt M1873 was so popular that they are still being made in a 3rd generation model. The 1st generation was manufactured up until 1941. The M1873 was made as a single action in .45 caliber. How I would love to own one of these original guns… the Colt Army 1860 was made for issuance to Civil War soldiers and officers. It was a .44 caliber cap and ball that was a muzzle loaded 6 shot revolver. These sidearms were accurate at 50 yards give or take. Both Union and Confederate soldiers carried these guns. Considered one of the 1st versions of the Colt New Service pistols, the Army Model 1909 was a double action revolver that was very popular. Many variations were made and these Model 1909 had a large production. The Colt Army Model 1909 came in .45 caliber. 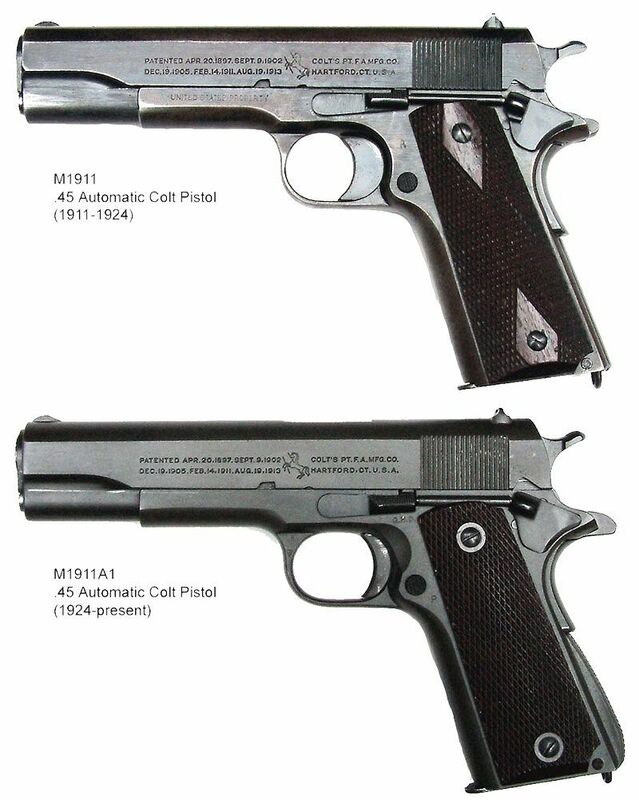 I mentioned the 1909 above and the Colt M1917 was essentially a better design of the 1909. 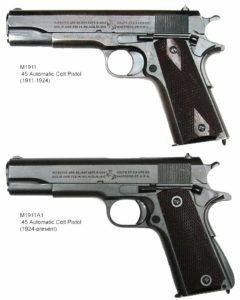 The U.S. Military was suffering a shortage of the M1911, so Colt and Smith & Wesson began producing M1917 pistols to make up for supply shortages. It was made in .45 caliber. This beautiful pistol was designed from M1911 pistols in stock at the Rock Island Arsenal. About 1,000 of these pistols were made for high ranking officers. It had an elaborate finish and was engraved with General Officer’s Model and Rock Island Arsenal on the slide. These .45 caliber sidearms were produced from 1972 to 1981. When an officer left service, they could purchase their sidearm from the Army. This sidearm which is used even to this day until users are issued the newer SIG Sauer is highly favored by many combat personnel. The short barrel and ease of action has caused a huge debate between M11 lovers and M9 lovers. This gun was made in the NATO consistent 9 x 19 MM Parabellum rounds. The Beretta also was made in the NATO friendly 9 x 19 MM Parabellum loads. I believe many soldiers would opt to have one of the John Browning designed M1911A1 .45 caliber pistols instead of the 9 MM rounds. The original M1911 had a few small issues that were mended with the development of the M1911A1. These guns are so sought after that Colt still manufactures the M1911A1. They are slim and easy to carry and the stopping power is amazing. Personally, this would be my choice of a weapon on my side in war. So this is my opinion of the top 10 Army pistols of all time. I would love to hear your stories of any of the sidearms you have used or owned. Do you believe the new SIG Sauer model will be a good addition, or are you like many who believe they should go back to .45 caliber? Let’s hear your thoughts and opinions. And, please share this post with your friends and family on social media.